IM Product Creation Simplified is the most definitive starter kit to help you create your own IM products FAST and EASILY for PROFITS! This starter kit consists of 16 modules with FULL UNRESTRICTED PLR, written and targeted for the beginner audience laying the FOUNDATION for you to create your own products around the modules included in the kit!!! In short, YOU will be the GURU teaching YOUR LIST OR CUSTOMERS the art of internet marketing MAKING YOU AN INSTANT AUTHORITY FIGURE!!! The 16 modules included with IM Product Creation Simplified contain information on virtually every aspect of internet marketing including offline marketing all written for the beginner audience! The Ways You Can Use IM Product Creation Simplified Are Numerous! 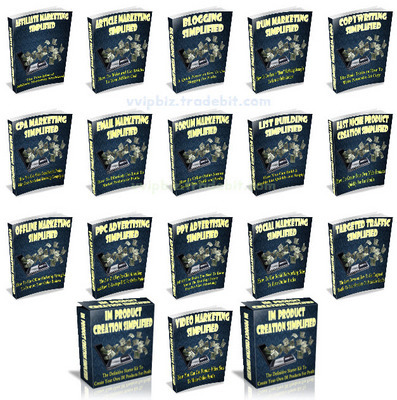 Im Product Creation Simplified Pack Plr!